If you have $25 to spend, you’re about to free up a lot of storage space on your iOS devices. On Monday, Apple officially released iTunes Match in the United States, with an update to iTunes for Mac and PC. The company missed its initial deadline of a late October release, but a note to developers last week indicated the feature’s launch was imminent. iTunes Match, part of the iCloud suite that launched earlier month, stores the entirety of your music library in the cloud, at a cost of $25 per year. 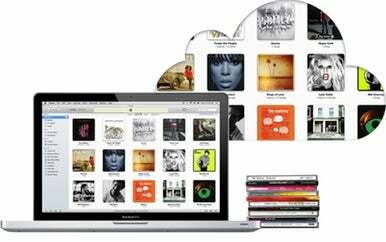 Unlike competing cloud storage music services from Amazon and Google, iTunes Match saves a lot of bandwidth and time in your initial synchronization, because Apple can identify which songs in your iTunes library are already available in the iTunes Store. If Apple can positively match a song in your library with any of the 20 million tracks for sale in the iTunes Store, it won’t bother uploading that song; only unmatched songs get uploaded to the cloud. Once iTunes Match is finished indexing your library, you can connect to your music from other computers, along with your iOS devices. Any matched music you stream from iCloud plays back at 256-Kbps quality—even if your original copy was encoded at a lower quality. To get started with iTunes Match, fire up iTunes 10.5.1 and look for the new iTunes Match entry in the Store section of the sidebar. 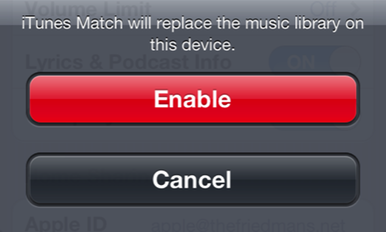 Once you subscribe, iTunes Match starts indexing your music right away. You can watch its progress, or continue rocking out to iTunes instead while it does its thing. Once the initial iTunes Match sync is completed, you’re ready to get started. On your iOS 5 device, go to Settings -> Music and slide iTunes Match to On; then tap Enable when asked to confirm. That’s it—switch to the Music app and, after a few minutes for your iOS device to finish syncing, your iTunes playlists will appear. Songs will download to your device when you play them, and you can also tell the app to download complete playlists or albums. Apple hasn't yet invited folks with gargantuan music libraries to the iTunes Match party. The service currently includes a 25,000 song limit, although iTunes Store purchases don't count towards the total (assuming they are still available in the iTunes Store, that is); if your library is any larger, you can't sign up for iTunes Match. We’ll have our first look at iTunes Match soon. I’d love to use iTunes Match, but my iTunes library has more than 25,000 tracks. When I attempt to use the service I’m told that I have too many tracks. Is there any way around this? There is, but it’s not an entirely scenic route. iTunes Match—at least up to this point—places a hard limit on iTunes libraries. Either you have fewer than 25,000 tracks (not purchased from the iTunes Store, as purchased tracks are not counted against this limit) and everything’s hunky dory, or you have more than 25,000 tracks and you’re barred from the door. 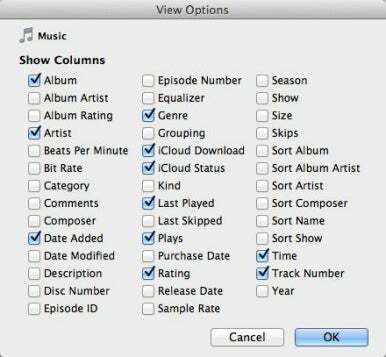 In a perfect world, rather than giving you the boot, iTunes would then offer a suggestion along the lines of “Since your entire iTunes library is too expansive for iTunes Match, would you like to upload some of your favorite playlists?” But it doesn’t. So you must take matters into your own hands. And that means feeding iTunes Match a different library. Perhaps no part of Apple’s iCloud service has prompted as much interest as iTunes Match. You could attribute that to a number of factors, including Apple’s industry-dominating music store, iTunes Match’s library-matching system, and the fundamental integration with all of Apple’s devices. But in general, I think it’s the idea of having your music everywhere, always at your fingertips, that’s really captured the interest of users. On Monday, iTunes Match officially launched for U.S. users. So, now that the feature is actually available, what can you expect? I’ve had some time to take iTunes Match for a spin, so here’s a look at what it’s all about. Given that iTunes Match was announced at Apple’s Worldwide Developers Conference in June, you’re probably familiar with it, but just in case you need a refresher course, here’s what the feature actually does. So you’ve bought iTunes Match, which gives you access to shiny new 256kbps AAC versions of your audio files. But by default your iTunes library is still packed with your old files. So how best to upgrade all of those old files, in place, to the new versions? When Apple announced iTunes Match in June as a part of a raft of announcements related to iCloud, I was a little skeptical. I had just been released from my annual $99 payment to Apple for MobileMe, thanks to iCloud—I wasn’t excited about a new annual subscription taking its place. Instead, I ended up figuring I’d pay $25 for iTunes Match, upgrade my tracks to higher-quality versions, and then never pay again. I heard a lot of other people saying the same thing. Perhaps back then the details of iTunes Match weren’t quite clear enough, or perhaps I just wasn’t prepared to understand them. But after having used iTunes Match for a few weeks now, I’ve come to appreciate the service quite a bit… and have accepted that I’ll probably keep paying for it for years to come. With iTunes Match, that stuff—most notably playlists and song metadata—goes everywhere and stays in sync. You could completely delete your iTunes music library on your main computer and then reconstitute it from the cloud, playlists included. As someone who has had to build and re-build playlists over the years, that’s pretty cool. When you enable iTunes Match on an iOS device (Settings -> Music -> iTunes Match), you'll see a warning that “iTunes Match will replace the music library on this device.” When iTunes Match was still in beta, that message was true to its word: Any music you had on your device was indeed deleted, in favor of the library you'd uploaded to the cloud via iTunes Match. But in the official version of iTunes Match released Monday, that’s no longer the case. In truth, any music that was on your iOS device before you enabled iTunes Match will still be there—and that fact can save you on time and bandwidth. In our testing, this message is a big fat lie. After you've enabled iTunes Match, it downloads songs to your iOS device on an as-needed basis: When you tap on an individual song, iTunes Match downloads it first, then starts playing it. (That accounts for the slight delay you'll notice before the track begins; iTunes is buffering the download.) After you've played that song once, the downloaded copy stays on your device. The next time you want to play it, it’ll already be there; it doesn't need to be downloaded again. Tracks that are available via iTunes Match but haven't been downloaded yet are marked with an iCloud icon. Once you tap to play them, that icon disappears. But those already-played songs aren't the only ones you'll find on your device: Despite Apple’s warning, any songs that you had synced to your device prior to turning on iTunes Match will still be there. They don't display an iCloud icon; your device and iTunes Match are smart enough to recognize that the tracks are already available. However, after you enable iTunes Match, you can no longer sync music via iTunes; if you try, the Music tab for your device in the iTunes app will indicate that iTunes Match is on and will offer the option of syncing Voice Memos only. So let's say you want to have the $149 complete Beatles anthology —more than 250 tracks—on your iOS device. You bought it some time ago, but never synced it to your iOS device. Now, the only apparent way to get all of those tracks on your device again is to tap on The Beatles from the Artists tab, scroll to the bottom of the albums, and tap Download All. That would seem to be a big waste of time and bandwidth. iTunes Match has arrived, and it’s the subject of this week’s Macworld Podcast. Senior associate editor Dan Moren, senior editor Christoper Breen, and staff editor Serenity Caldwell have spent the past few days learning all there is to know about Apple’s $25-per-year music service, and they’re ready to drop some iTunes Match-based knowledge on you in the next 28 minutes. Among the icons you might see in your iTunes library after enabling iTunes Match is this unfriendly guy to the left: a cloud with an exclamation point in it. No, it’s not hinting at a chance of inclement weather; it means that iTunes Match has encountered a problem while scanning the track in question. Of course, iTunes isn’t very helpful about it: Enable the iCloud Status column in iTunes and you’ll simply see “Error”; click on the exclamation-point-bearing cloud icon and you’ll get this “helpful” dialog box. Generally, what this really means is that there’s a corruption somewhere in the file—it may be one that you can’t even detect by examining the file or even by listening to it. 1. In iTunes, select the View Options item from the View menu. From here, make sure that both the iCloud Download and iCloud Status items are selected. The Download column displays icons indicating the current status of your songs. These icons generally appear only when an action is pending or if something has gone awry—such as a song that is ineligible to upload or an error in the uploading process. That’s why, if all has gone well with your initial iTunes Match setup, you should see few if any icons in this column. One exception: a Download icon may appear even though nothing is wrong; I’ll get to this in a bit.